We don't do chippies, unless there's seating like Neptunes or they're gourmet like Hot Chip or Kev's coming with us to the Flaming Fryer or it's nearby like Admirals et cetera. Or it's a really awkward time in the afternoon, say 3:45pm, and we've got 45 minutes to tick off somewhere that wasn't even on the ToDo list. No fried and sliced potatoes for us today but we will have some condiments on our meat: chili for Andy and straight-up "burger" sauce for me. Wrapped in plain white chip-shop paper, we gamely consume our very large snacks under a Pukka Pies clock while a wall-mounted telly plays Judge Judy or similar. Yes, we remain classy. 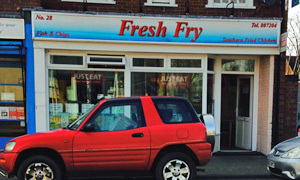 FF forms part of the enormous Just Eat empire, if that's your bag, and I believe there's another FF up off Foxhall Road, if you'd like to do the set. There are scary looking pickled eggs and pickled onions too. I'm sure this place would more than see you right on the way back home after a night out, but it's hard to recommend late afternoon. And boy, does that doner stay with you. If it was a car -- Tofas Sahin. If they were passing by -- Danny Dyer.